You have made it big in Bhojpuri cinema in just one-and-a-half years and six films. 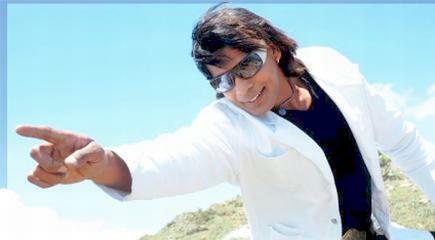 There are also 80 Nepali movies I have done. The experience I got there has stood me in good stead. My first Nepali movie was “Agneepath” which was made six years ago. There was a lot of struggle before I became popular in Nepali cinema. But I trusted myself and had the courage. Any particular reason for entering Bhojpuri cinema? Bhojpuri producer and director Ramakant Prasad saw my movies. He belongs to Ruksaul, which is on Nepal border. He offered me work. That was a big moment for me and “Laagal hai ae raja ji” became my first Bhojpuri movie. I was introduced in the movie with Nirhua. The movie proved to be a hit. Is your pairing with Nirhua seen as a hit one? I have done three movies with him and all three have been hits. There are two movies to come that will have both of us. We are waiting for “Dushmani” and “Diljaley”. It is said that in this industry, the superstar eats up the co-star. I had the opposite experience with Nirhua ji. He has always treated me as an equal and even encouraged me at times. He creates such an atmosphere on the sets that even a newcomer gets excited. I am soon coming with Ravi Kishan and Pavan Singh. But superstars have their own egos that clash. I don’t meddle with other people. Every actor is there with his character and has his own worries. Each one has the desire to show himself in the best light. This is healthy competition. We actors keep meeting outside of the sets, too, and I have never seen any bitterness. If the tuning is right, the result is good, too. What have you learnt working in Bhojpuri industry? Nepali or Bhojpuri, there is struggle everywhere. If you have patience you will be here for a long time or will be hauled out with your belongings. As an artist, all of us get to learn something or the other here. As a person, there is a longing to create respect for yourself. What is the difference that you see in Nepali and Bhojpuri movies? No difference. They have the same making and technique. Scripts are similar, too. It is tough to differentiate between both because both regions are neighbours and they share the culture and people. “Damini” was shot in Nepal and dubbed in Nepali, too. Several actors in the movie were Nepalis. If Nepali movies run in Indian cinema halls, Bhojpuri movies are also released there. The only difference is that while Bhojpuri movies may have 10 songs, Nepali movies have only about four-five songs. I don’t agree with that. If the image of Bhojpuri was so bad, it would not have flourished so much. Bhojpuri movies are released all over India. It will be unfair to reject the industry on the basis of a few movies. Bhojpuri has good technicians, producers and directors. We are behind Hindi movies only because of the budget and you can understand the difficulties one faces with that. You are here to make a career. How do you see the future of Bhojpuri cinema? Bhojpuri is still growing. There are several milestones in its journey and several downturns, too. But that didn’t stop Bhojpuri cinema from growing. Everyone thinks it has a bright future. You have a line of movies. Not a line, but yes, quite a few. I don’t want to blindly sign movies. I want to let my audience wait. That will tell me how much they love me. I want good stories, producers and directors. I don’t want movies that are only statements. Are you also on your way to stardom? All new actors like to call themselves that. I want to remain an actor. It is not in your hands to become a superstar or not. I am still learning. Why did you choose Bhojpuri to learn? Why didn’t you opt for Hindi movies? I was happy working in Nepali movies. I got an offer from Bhojpuri and came here. If I get an offer from Hindi movies, I’ll go there, too. Art has no caste or religion. There are talks going on in south India. I want to work in every movie industry. But for that one needs to really work hard. What kind of response do you get when you are with the audience? Lots of love and respect. Everyone considers me their own. People also suggest to me the kind of roles I should do. Now they tell me I should do solo roles. What kind of roles do your fans like? Action. People have categorized me as an action star. So I have to do action with different styles. I was always interested in action. I have learnt martial arts in Dehradoon. How does the action star like to dance and sing? It is a nature and I have learnt it, like Sunny Deol. I belong to Dhangarhi in Nepal that adjoins Nainital. I was educated in Dehradoon and also worked as a model then. When I was very small. I always liked Mithun Chakravarty and still do. Didn’t you ever feel like running away to Mumbai from home? Not at all. I was never in a hurry. I wanted to do this in a planned way and that’s how it is happening. How is it with Bhojpuri heroines? Lovely. But I am more natural with Pakhi and Rani. It has been nice with “Lagal hai ae raja ji”, “Diwana”, “Aag”, “Hum hai hero Hindustani” and “Jaanbaaz jigarwale”. But I am waiting for “Odhaniya taan ke”, “Pyaar kare la himmatwala”, “Diljale”, “Dushmani”, “Hote ba jiwani ab jiyan ae raja ji”, “Kaisan piya ke charitra ba” and “Raja ji I love you”. I have got a chance to work with Rinku, Monalisa, Rakhi Tripathi, Ruby Singh, Priya Sharma and Rani Chatterjee with these movies.